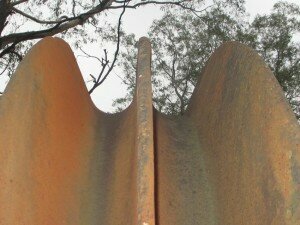 This web page is to compliment the blade sign installed at the turn wheels opposite the Megalong Valley Tea Rooms. 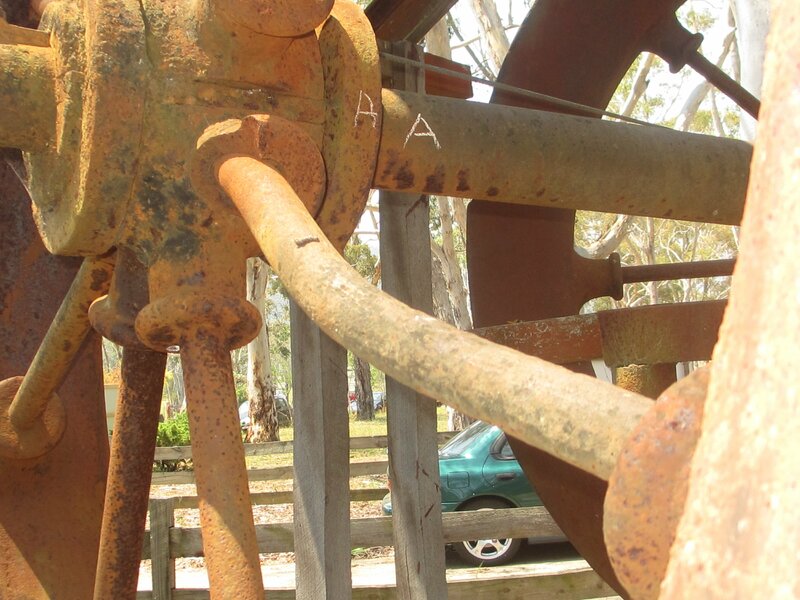 These wheels were rescued from scrap dealers determined to smash them up, by Keith Duncan, the original owner of the Megalong Valley Tea Rooms and mounted opposite the Tea Rooms in 1985. These wheels which were manufactured in Leipzig Germany about 1882, are made so that the shaft and wheel can be assembled on site, because of the obvious difficulties of transporting such an awkward shape, and being made of cast iron, easily damaged by rough handling. The casting of these iron counterwheels had inherent problems.The 8 spokes are pre-made and cast into the wheel when the rim and the hub are cast.The hub is cast in two halves, to avoid the problem of breaking of the hub as the casting cools and shrinks.The shrink rings are then installed to hold the two halves of the hub together. The spacers are carefully sized so as not to pull the hub in too much and tear it away from the spokes, and not too little so that the spokes are not tight. If they are loose, the spokes will move in the casting as the wheel rotates, and ultimately cause failure.The internal diameter of the shrink rings are machined to be .002” smaller than the OD on each side of the hub, then heated to red heat, placed in position and allowed to cool, pulling the hub tight onto the spacers, and making the whole wheel a single entity. The key is the next important point. It is a 1:100 tapered key, and is what tightens the hub onto the shaft. The wheel is pushed onto the shaft, and then the key is driven into the tapered slot in the hub until it cannot be driven any further. This key has a head to enable it to be driven, and as such is called a “Gib Key”. This slot was probably filed by hand. Some additional key length is provided, in case of loosening, whereupon it can be driven in further still. As these are idler wheels, this type of key is sufficient. The friction grip of the hub and the key on the shaft only had to overcome the friction of the two steel to steel bearings. Driving of the key pulls the hub slightly off centre and tightens it on the hub. The gap between the hub and the shaft made as the taper key is driven into the hub can be clearly seen. You can see the 3/32” gap where the key has taken up the clearance of the hub. 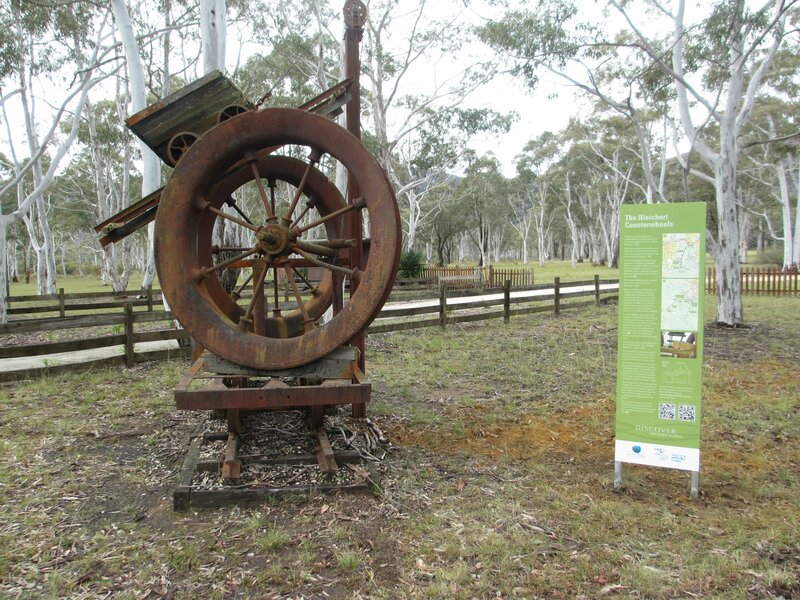 These wheels were made in 1882 for a ropeway to haul coal from the Gladstone Colliery situated between Leura and Wentworth Falls to a rail siding. When installed in the Gladstone drive, these wheels were mounted long shaft down and served as counter-wheels. 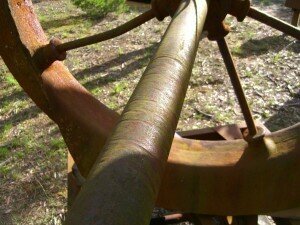 The haulage rope came into the drive or “Bull” wheel, did a half turn, then transferred to the top groove of the counter-wheel, half turn, then the middle groove of the Bull wheel, then the bottom groove of the counterwheel, then the bottom groove of the Bull wheel, then back to the ropeway. There was a double drive at this point on the Gladstone ropeway so two counter wheels were needed. 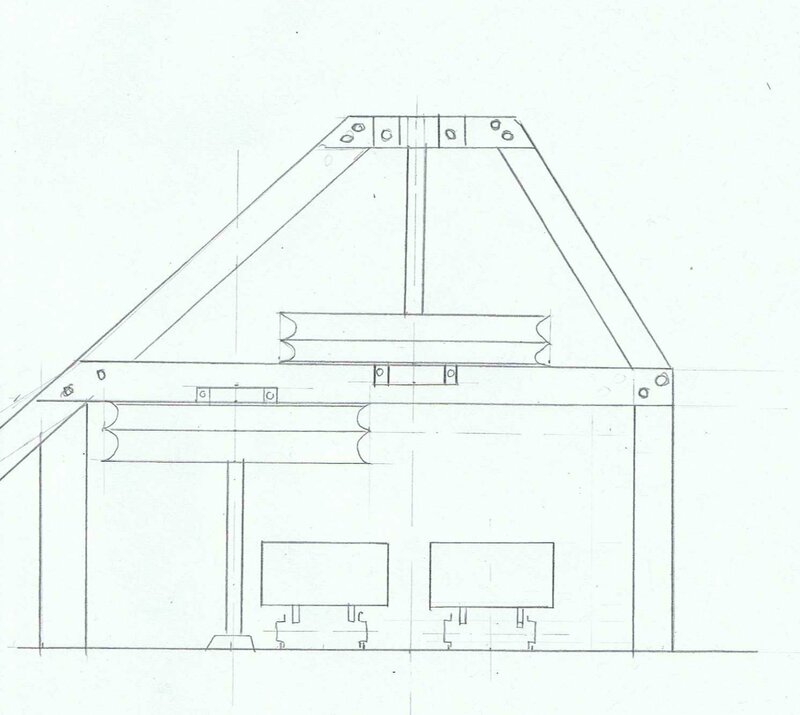 The basic layout, with the central drive wheel, and a counter wheel mounted on each side. 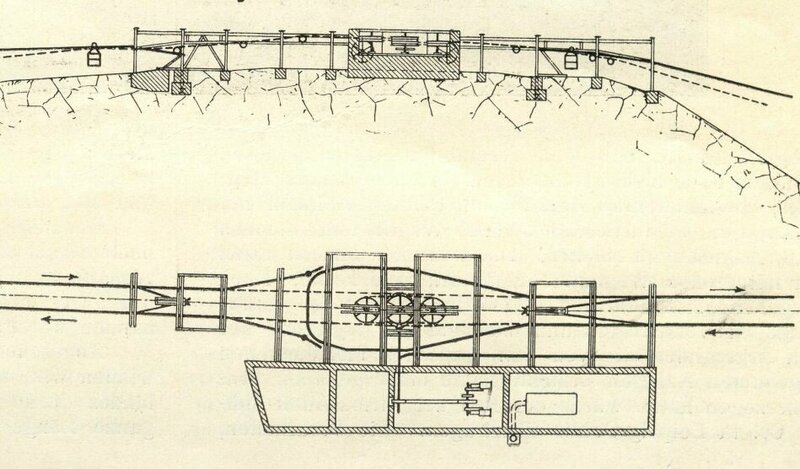 This is an illustration from the Chilecito Ropeway in Chile, and is a much later period that the 1883 Gladstone ropeway, circa 1900, but the double drive principle is the same. Thanks to Peter von Bleichert, I have lifted this drawing from his book on Bleichert Ropeways, available through Amazon. 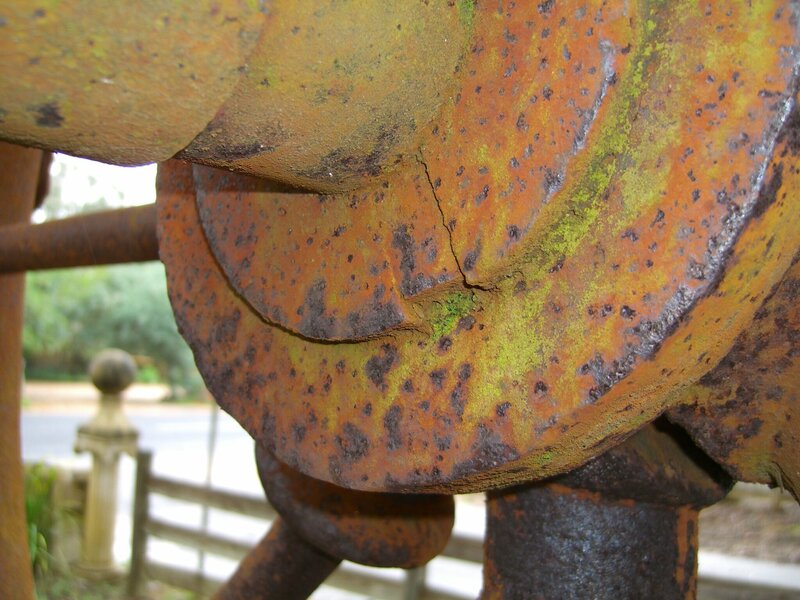 The wheels were “surge wheels, designed to allow the rope to “surge” or creep up the sloping flange on the outside as it transferred from the drive wheel to the counter wheel. The distance from the tip of the flange to the centre of the rope groove is 5”, this tells us that the grooves in the drive sheave were 5” apart. In 1889, the entire ropeway was moved to the Katoomba Colliery, to use it to bring Oil Shale 2 ½ miles from the Ruined Castle mines, to be transferred to an over-rope tramway which took it to the rail siding at Katoomba. ( Over-rope means that the haulage rope is on the top of the skips, some flat installations had the haul rope underneath the skips. If under-rope is used where there are up and down hills the rope can lift the skips off the rails at the bottom of the hill ). In this application only one counter wheel was required. The drive lasted six months before a track rope failure caused it to be abandoned. 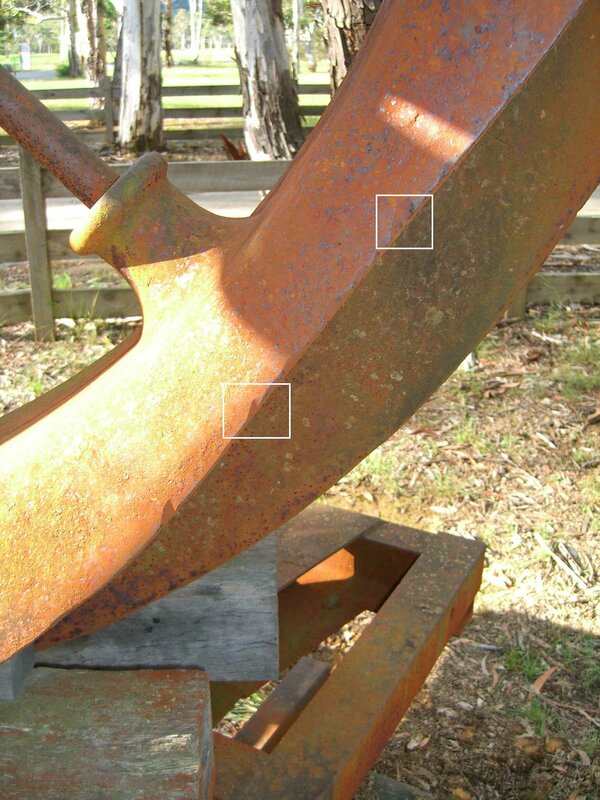 There is a light rope groove in the centre of the upper groove of the LH wheel in the picture above, indicating that this wheel was used for that purpose. 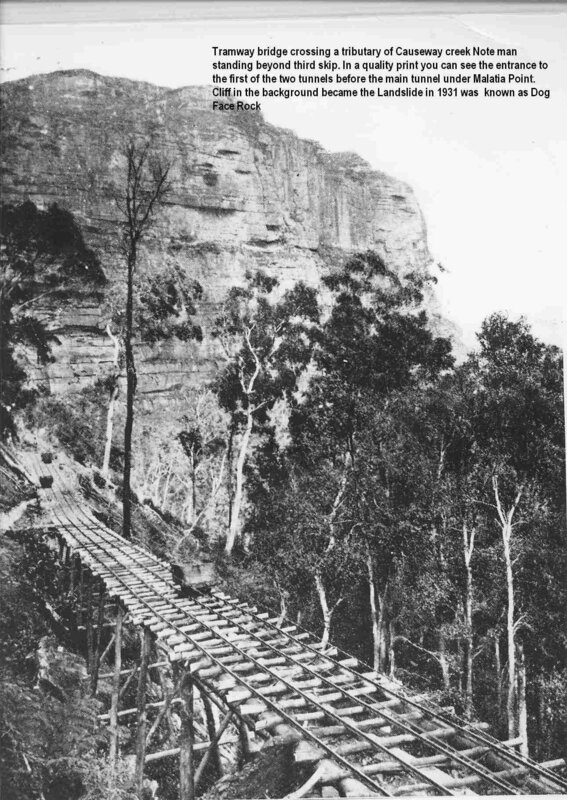 In 1891 the two counter wheels were moved to the Megalong Valley to become turn wheels on the over rope tramway bringing Oil Shale from the Glen Shale mines to the foot of the Katoomba Incline.The tramway turned 53 degrees to the SW at this point.The same drive was now used without a counter wheel as the load was considerably less than originally designed for at Gladstone, and a single tensioning wheel was used instead. But trouble was in store! The wheel bringing the shale away from the mine, the outbound or upper wheel, which was carrying the heavily loaded side of the tramway, had a flat section of track on the approach side, and steeply rising track toward Narrow Neck Tunnel on the departure side. Probably an upthrust rail was sited 50 metres on the uphill side both of the wheels to prevent the ropes from rising and lifting the skips off the tracks, and to keep the rope low enough for the skips to be re-hitched to it. The outbound wheel was installed upside down, with the long shaft to the top, and above the inbound wheel. This was made necessary because the wheels were too big for the job and had to overlap to maintain the 4’ track centreline separation. Careful analysis of the rope grooves worh in both wheels, allow me to make the following proposals.The only rope groove on the outbound wheel is below centre of the lower groove indicating its use in the upside down position. 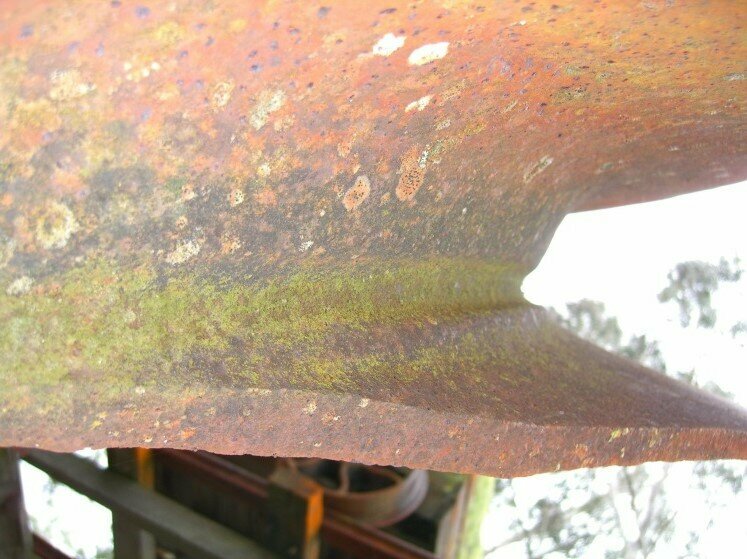 It is a very slight groove and doesn’t photograph well.This photograph is of the rope groove in the inbound wheel and is also on the lower side of the lower groove, and here is severe, probably from the rope slipping around the wheel because of insufficient tension to turn it in its bearings, a problem created by the weight of the return skips coming down the hill approaching the wheel. There are rope marks on the inbound shaft, where the rope has escaped from the groove and worked directly on the shaft, another problem caused by a slack inbound rope. The outbound wheel has moved along its shaft 2 ¼”, and the tip of the Gib Key is projecting ¾” through the hub. 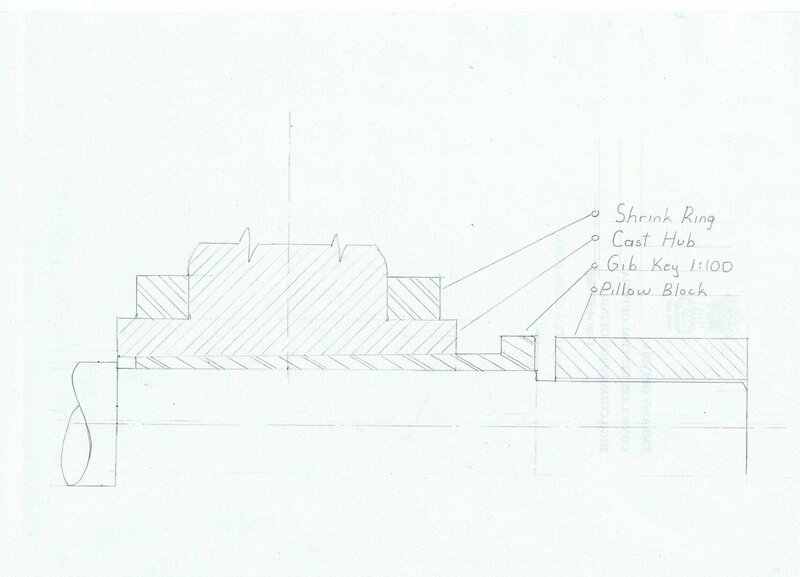 ( See photos and sketches below ) There is a hammer mark on the tip of the key. 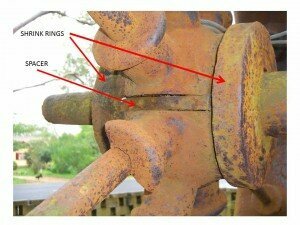 There is a large ½” thick washer against the shrink ring then a two bolt clamp then two spacer washers, bearing on the face of the pillow block bearing.The projection of the tip of the Gib Key out of the hub is the “key” to this whole problem. 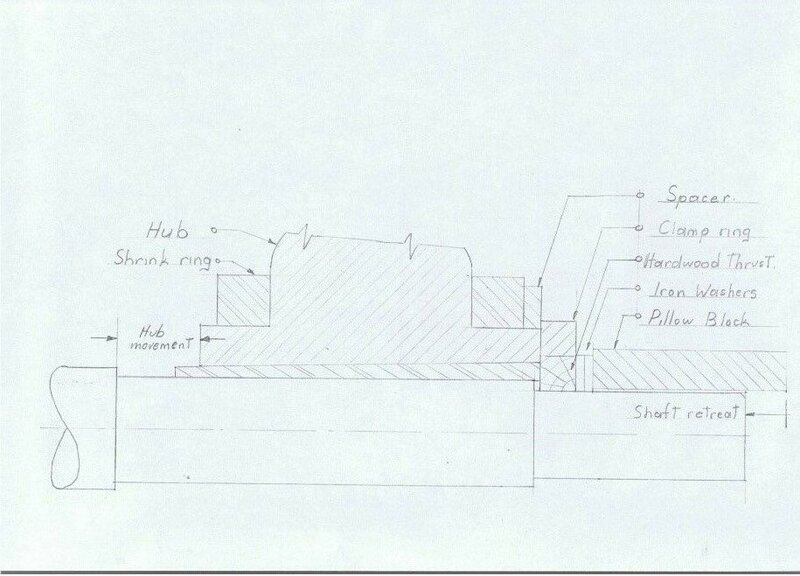 This indicates that the key was not a good fit in the tapered groove in the hub, and that when it was fitted to the shaft the tip of the key bottomed on the shoulder of the shaft and could not sufficiently tighten the hub onto the shaft.That however wasn’t an immediate problem in the wheel’s first application at Gladstone, because it was operating long shaft down and the hub was sitting on the shoulder on the shaft, apparently being tight enough to turn the shaft in the bearings.When the wheels were moved to Katoomba, the inbound wheel gave no trouble.Once they were moved to Megalong, the fault was exposed when the outbound wheel was turned upside down to be installed.Initially it was lifted with a tripod and block and tackle, using ropes tied around the rim and/or spokes on the wheel.When it was lowered into position and the shaft end inserted into the pillow block, the end of the shaft rested on a hardwood block at the bottom of the pillow block, put there to take the vertical load on the end of the shaft.So as the shaft rested on this thrust block and the ropes were removed from the wheel, the vertical load of the weight of the wheel was, for the first time since it was assembled 7 years before, taken on the taper of the key.It did not hold and the hub slipped down, pushing the head of the Gib key against the face of the bearing block and forcing the key in and really locking it in place, as it should have been in the first place.Now the trouble really starts! 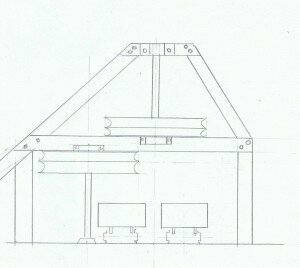 As you can see in the sketch above, there is little space to spare between the lip of the sheave and the supporting timber, so a small movement downward, jams the lip of the sheave on the timber. OK, so we just need to loosen the key and push the shaft back in. Yeah, right! This is a 1:100 taper key, specifically designed not to let go, once established, something of which the resident blacksmith was unaware. 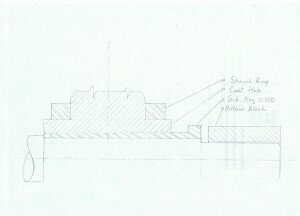 The solution was firstly to cut off the head of the key, probably with a hammer and chisel, then try hammering the back end of the key to try to loosen the key and hence the hub on the shaft then push the shaft back. *The fact that the key is sticking through the hub, tells us that it wasn’t tight in the first place, and that it had bottomed on the shoulder in the shaft. Normally when this happens the key is withdrawn, and a replacement key is used. *They didn’t give the 1:100 taper on the Gib Key enough respect, because neither the key nor the hub would move, so with the rim of the wheel resting on the cross timber, they tried to sledge hammer the shaft back into the hub. All they succeeded in doing was mushrooming the end of the shaft, and breaking the rim of the wheel. In the ropeway configuration, this end of the shaft was at the bottom end, and was mounted in a thrust bearing to take the weight of the wheel. 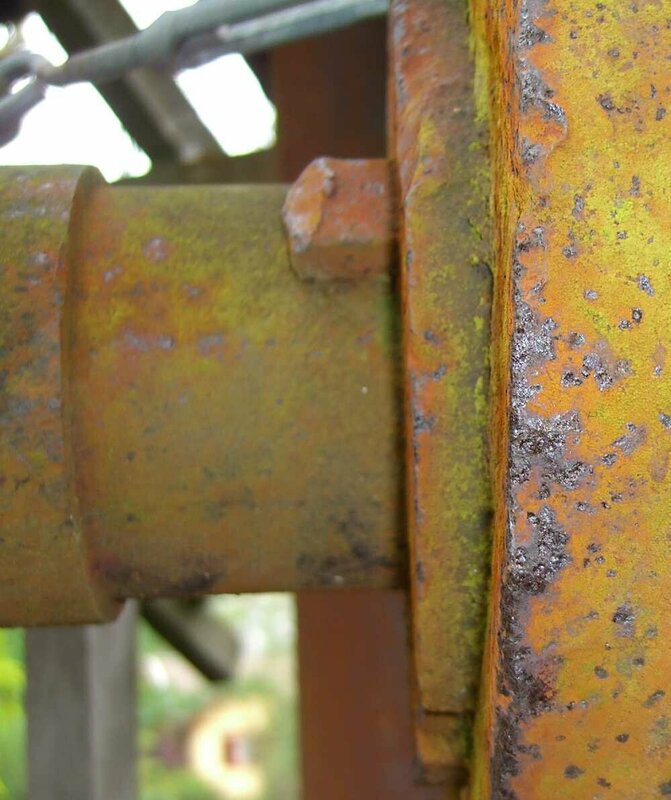 The rim was readily repaired by riveting the piece back in with a reinforcing strip on the outside, but the old thrust bearing end of the shaft had been ruined. There are no marks on the shaft to indicate how a replacement bearing was used on the upper shaft, so it remains a mystery. 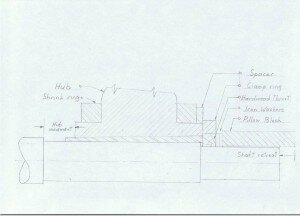 Possibly just a hardwood block was bolted over it, as a pillow block like the one in the photos below, could no longer be fitted to the shaft because of the mushrooming. This is the original arrangement of the inbound ( lower ) hub on the shaft; with the tip of the key correctly positioned just clear of the shoulder on the shaft. On the outbound ( upper ) wheel, the tip of the key was touching the shoulder, and hence was not fully tight. This was the solution that the miners came up with after the wheel had slipped down the shaft. They inserted a spacer, then a clamp ring holding two hardwood thrust blocks in place against two more washers bearing on the face of the pillow block. The clamp ring could be removed to replace the thrust block if needed. There seems to be no lubrication facility on the lower plain bearing, maybe they just poured oil over everything. Remembering that oil in 1890 wasn’t what we know today.The shaft is too rusted in to determine the state of wear of the bearing. You must have been able to hear them squeak a mile away!This is the steel/steel plain bearing. The turning centre can still be seen in the end of the shaft.The distance that the wheel slipped down on the shaft is the same as the distance that the shaft has retreated inside the pillow block. There is a 1/8” gap between the shaft and the block on this side of the bearing indicating how much it has been worn. 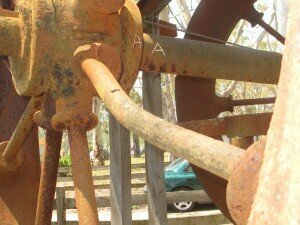 Some further notes on the Gladstone Ropeway. Counter wheels are used for an aerial ropeway drive when the bull or driving wheel requires more than one half turn of the haulage rope to provide enough friction to drive the load. The rope passes a half turn around the bull wheel then a half turn around the counter wheel, then the bull wheel again, until all the grooves are used. These counter wheels have two grooves so it is assumed that the bull wheel had three grooves. Although the drawing above is from 1902 design, 15 years after the Gladstone ropeway was designed, and many improvements had been made, the Gladstone drive was still in the centre of the ropeway, determined by the geography of the ropeway. This meant that the bull wheel had 6 grooves, 3 for the haulage out of the valley, and three for the transport to the railway siding. One counterwheel was used on each side of the bull wheel. In these early designs the counterwheel was a slightly smaller diameter than the bull wheel, to allow the rope to be fed directly onto the Bull wheel’s first groove without interfering with the counter wheel, from a rope sheave which controlled the height of the incoming and outgoing haul rope, which was critical for the clipping and unclipping of the rope grips. 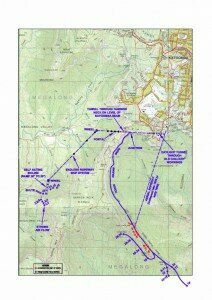 There is one puzzle however, the Gladstone mine elevation is approx. 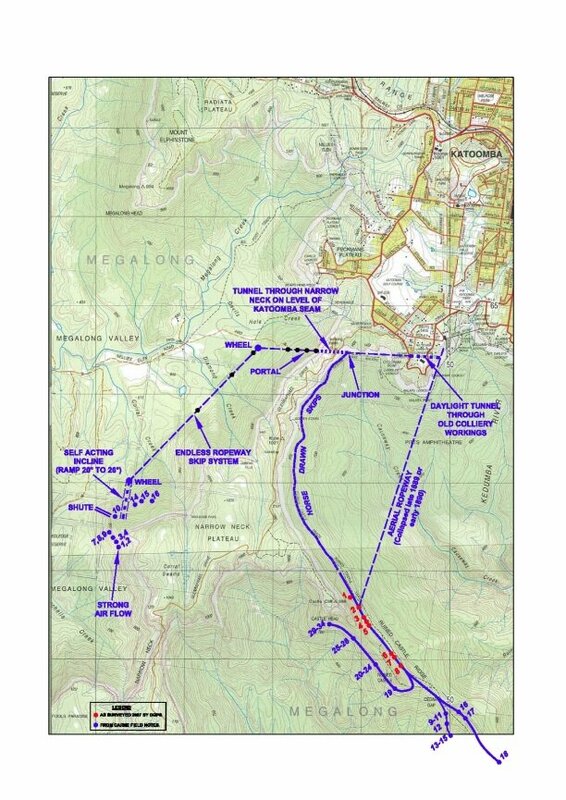 720 metres, the drive elevation 908 m, a climb of 180 metres in 600 metres, average gradient 30%, while the rail siding elevation is 928 metres, a climb of only 20 metres in 1380 metres, average gradient 1.4%. 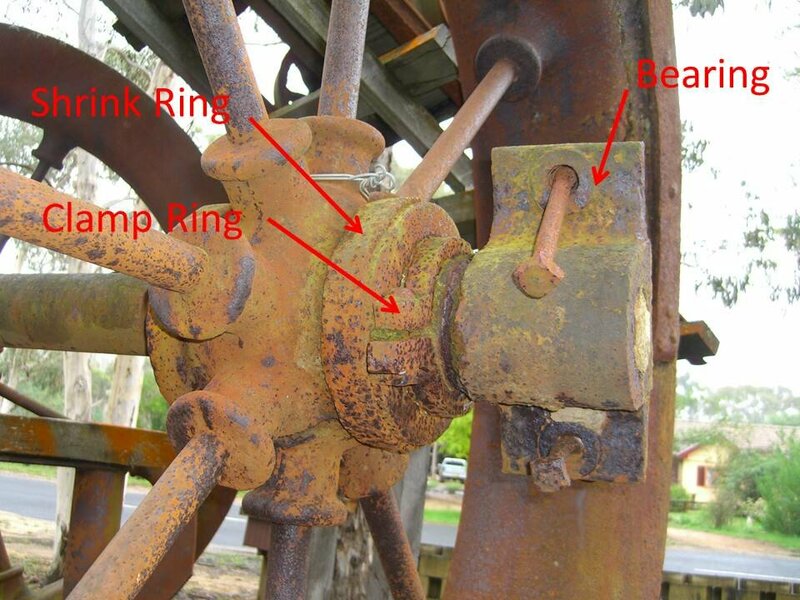 So why a double grooved counterwheel and triple grooved bull wheel was deemed necessary for the second half of the ropeway, for such a small climb, is a mystery. One possible consideration is friction, for a run of 1380 metres, there were roughly twice as many buckets and idler wheels than the 600 meter run, and on a smaller gradient the friction component is higher. A SMH newspaper article from 1883 reporting on the opening of the Gladstone Mine, states that the haulage rope up the hill from the mine was 1 1/4″ dia. and the rope to the rail siding was 1″ dia. This information is not supported by the rope grips still remaining, which will only allow a maximum of 1″ rope. The oversize flanges on the wheels were the early method of dealing with moving the rope from one groove to the next on the bull wheel. 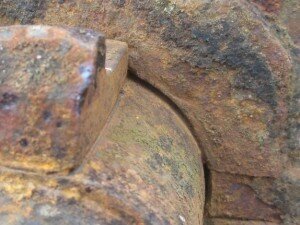 The lip of the upper groove was aligned 1 rope diameter above the centre line of the top bull wheel groove. The rope then slid down the flange to the bottom of the counterwheel groove, turned a half turn, then the centre flange tip was similarly lined up just below the centre line of the next bull wheel groove, so the rope could slide up out of the bottom of the groove and onto the rope groove in the bull wheel. The bull and counter wheel grooves also had to cope with the “spiders” in the ropes. The rope grips had forks which engaged with “spiders” which were steel plugs, inserted into the rope lay, and held there with pins or screws. The rope sheaves had to be large enough for these spiders to pass through without jamming, or damaging the sheaves. These counter wheels have an overall diameter of 80″ and a groove depth of 7″, giving a rope groove diameter of 66″ or 5′ 6″. The lower shaft is 3 1/2″ in diameter and they are 48” long with a 3” dia. shaft extension for the bottom thrust bearing. 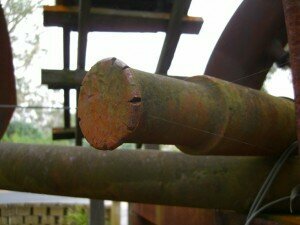 By 1905 this design had been changed, and the rope grips were friction grips, and did not need the spiders, as they were very damaging to the haul rope, causing severe local bending as the spiders passed over sheaves and rollers. 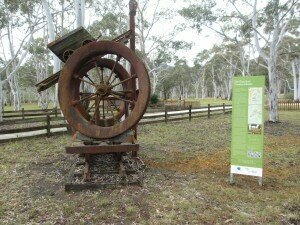 When the Gladstone Colliery was abandoned in 1885, the ropeway stood unused, until J. B. North decided to use it to bring Oil Shale from the Ruin Castle Shale Mines to the Southern end of his overrope tramway, then to be transported to the GWR Rail siding at Katoomba. 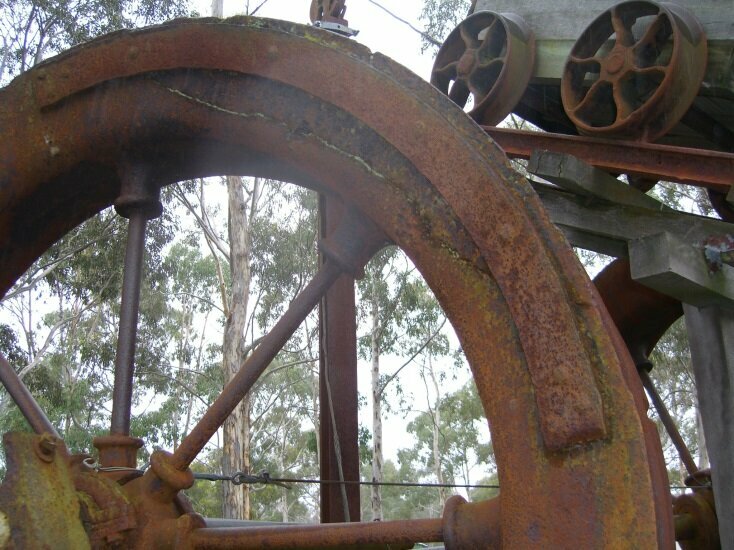 The configuration of the drive was changed for the Katoomba installation, and only one counter wheel was needed, as there was only one ropeway section from the Ruin Castle Mine to the clifftop. 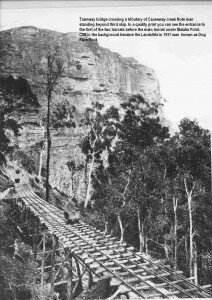 After the Katoomba Ropeway broke its outbye track rope in September of 1889, the drive again sat unused. In December of 1891 a re-engineering of the drive resulted in it being used to drive an overrope tramway from Mort’s Glen Shale Mines in the Megalong Valley, to the bottom of the Katoomba Colliery incline. As this drive was a much lighter load than the ropeway, it seems that the counter wheel was removed from the drive, and utilised with its unused twin, as turn wheels, where the tramway had to change direction 53 degrees to reach the Mort’s Glen mines, after passing through the tunnel through Narrow Neck, known as the Mount Rennie Tunnel. 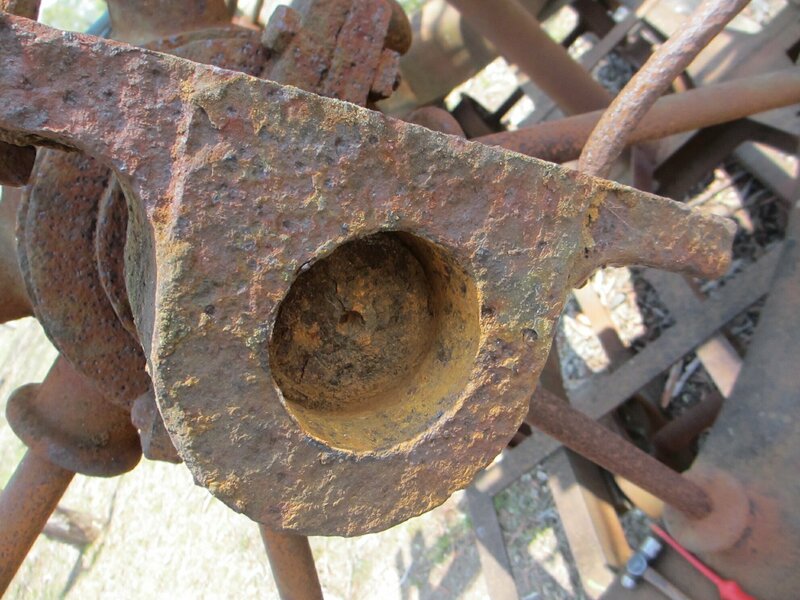 There are rope grooves worn in both the grooves of the lower inbound wheel, the bottom one much deeper than the top one, and only in the bottom groove of the optbound upper wheel, which was only used for the Tramway. As Gladstone only raised approx. 1,200 tons of coal, which would have taken a few days, the rope wear on the counter wheels would have been very small. I conclude that this wheel was used in the Katoomba drive, which also only operated for 6 months in 1889 with a considerable amount of down time for repairs and alterations, but enough to make rope grooves in both wheel grooves. The Katoomba Bull Wheel and its 80 HP steam engine, boiler and chimney, have disappeared, maybe gone to a scrap yard, or maybe moved to Capertee/Glen Davis with AKO&M’s operations there. The Mort’s Glen tramway operated for 5 years, with 23,000 tons of shale being carried in 1893, so the two wheels did much more work there. Visible on the upper rim of Wheel B, are several rope groves. I surmise that these marks were made when the haul rope for the tramway was being pulled into place. This was done either by portable steam winch, traction engine or bullock team. 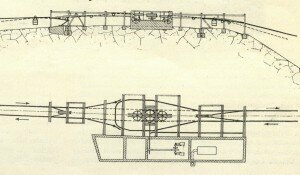 This was a very long rope, approximately 7,200 metres, probably 3/4″ diameter, weighing 12 tonnes, so considerable force was needed to drag it into position along the full length of the Tramway. As these wheels were positioned where the Tramway changed direction by 53 degrees, the rope tail would have to be pulled past the wheels for a considerable distance so that it could then be placed in the grooves of the wheels and then pulled along the second arm of the tramway. This may have had to be done several times, as there are multiple rope grooves in the rim, which all point in the same direction, so they were all probably done at the one time. In this picture you can see that the grooves are actually on the edge of where a large piece has been broken out of the rim of the wheel. From this we conclude that this damage was caused before the wheel was utilised in the tramway. Sheave A also has a bent spoke, which has also broken the inner spoke support on the hub. It is difficult to imagine how this could have happened under any operating conditions, even a derailed skip, or a skip still clamped to the haul rope, would not have sufficient energy to bend this very substantial spoke. Possibly it and the adjacent broken flange are a result of scrap dealer’s sledge hammers.